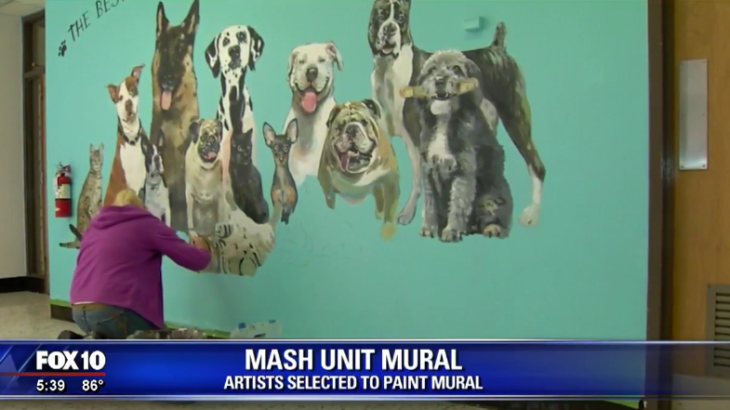 Back in July, the Maricopa County Sheriff’s Office announced exclusively on Fox 10 that it was holding a contest in search of an artist who could paint a mural inside the waiting room of the MASH Unit. Now we can report that a winner has been named. Plus, the painting is almost complete and Fox 10 viewers are once again getting a first look. This weekend, Gina Ribaudo put the finishing touches on her latest work of art. Reminding those who see it that the best things in life are rescued, like the dogs and cats from the MASH unit, where her mural is featured. “I think this mural really best represents what we do here at MASH,” said Valerie Stockton, and animal technician at the MASH Unit. Stockton says the main focus is rehabilitating the nearly 190 animals that have been rescued from hoarding or abuse situations…and finding them forever homes. “This gets a message out to be able to do something for the animals and get them adopted out,” says Sheriff Joe Arpaio. Arpaio started the MASH Unit more than 10 years ago. His inmates help with care…and he says Ribaudo’s mural will help them live better lives. Ribaudo’s rendition was one of six entered into a contest to spruce up the waiting room where pups like McKenzie are introduced to perspective fur parents. “So I kind of just sat down, went on line and looked up all the different breeds of dogs and cats and came up with that design,” said Stockton. A self-taught painter, Ribaudo spent twelve hours painting, giving her time, hopeful that someone else will see the beauty in both the art and the animals that are looking for a good home. The mural is available for the public to view. The MASH Unit is located between First Avenue and Madison Street in downtown Phoenix.